Triple Chocolate Cake from scratch:A double layer homemade chocolate cake come from scratch. I love ❤️ chocolate that why I’m fascinating of the chocolate cake. Why we call it Triple chocolate layer cake, but has two layers only? Well chocolate is used three times: chocolate cake, chocolate frosting, and chocolate decorations. That’s it now you know. I strongly encourage you to give it a try, to make even youre a newbie or beginners as it’s really not difficult to make. You may have feelings of little guilt though if you’re on diet, well little won’t hurt you. This recipe is come from scratch it simple as that. So let start. Pre heat your oven to 350 F , Grease and flour the 6 inch round cake pan. In a medium bowl or stand mixer if you have; add the egg,fresh milk, oil,sugar and vanilla extract then whisk well until combined and fluffy. On the other bowl sift the cocoa powder, flour, baking powder gradually add to the wet ingredients then beat until well incorporated. Then transfer cake batter to the greased pan drop few times to remove air bubbles. Remove cake from oven let it cool completely. While waiting for cake cool start to make syrup. Add all syrup ingredients in small saucepan bring to boil, stirring frequently. Just boil for about 3 minutes.then let it cool. To make chocolate frosting; put the chocolate chip in medium bowl. Them heat the cream and butter in sauce pan over medium heat and bring until just boil, do not over boiled. Remove from the heat and pour to the chocolate let the mixture sit for about a minute. Gently stir until very smooth. Let cool and refrigerate until firm. Once cooled and firm beat on medium speed using hand mixer until light and fluffy. Set aside. Then layer the cake spread the syrup each layer then pipe the chocolate frosting all over the cake. 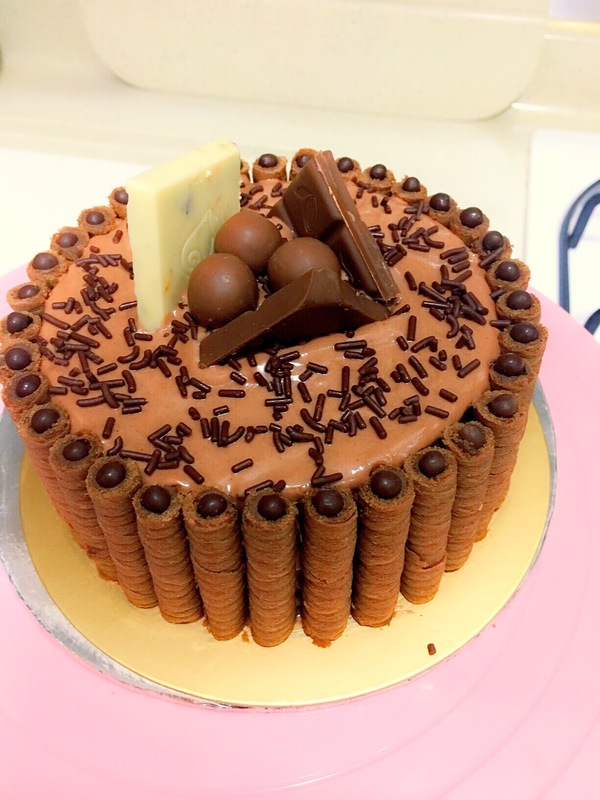 Sprinkle with the chocolate sprinkles on top of the cake and put the hazelnut stick waffer all around the side. Garnish with chocolate flakes. Very cute. And the wafers all around it solve the problem of perfectly frosted sides! OMG this is amazing! You just gave me an idea for my husbands birthday cake!